Although Sunday would be a better sailing weather day, the full crew was only available on Saturday. In spite of thick fog extending across Lake Michigan and very light winds, we decided to navigate through the fog to our confluence destination which lay in the middle of the great lake. We sailed on the Sailing Vessel Alliance, a 28-foot Sea Sprite. As a safely precaution, we raised our ship's radar reflector high on the mast to ensure that the Great Lakes ships could pick us up on their radar screens. After about six hours of motor-sailing with diesel engine and mainsail, we arrived at the confluence with perfectly flat seas. The calm waters helped us slowly navigate along the 43rd parallel to see how close we could hit the 87th western longitude. The GPS displayed all zeros, but the delay in the digital camera shutter response resulted in a photo within .002 of all zeros. I'm sure we would have had a much harder time reaching the exact confluence under sail in heavier seas. This location is classified by the project as "secondary" because land objects are not expected to be visible from the center of Lake Michigan. I used a coastal navigation technique to calculate the distance that a land object can be visible, given the height of the object, the height of the observer, and the curvature of the earth. With information from the FCC's database of broadcast towers, I was convinced that land features could be visible from the confluence. A TV tower in Milwaukee rises to a height that could be visible at this confluence by an observer standing on the deck of our sailboat 43 miles away. 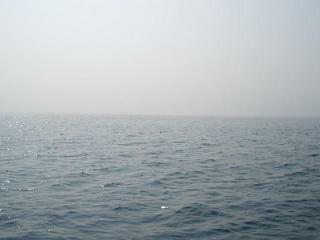 The day of our confluence visit was accompanied by greatly reduced atmospheric visibility. If the TV Tower is visible from that location, we could not see it due to it being obscured by the fog. However, as the atmosphere cleared up on our trip back, we were able to see the TV tower rising high above the horizon at about 25 miles from shore. Perhaps on a future visit with a clear atmosphere, we can establish this as a primary confluence. The compass-point photos were taken from the bow of the sailboat which was heading directly west and crossing the confluence. I started with the westerly point, and shot clockwise from there. As I took the final shot looking south, a ship appeared out of the fog and is faintly visible in the center of the photo. The ship is later clearly visible in my shot of the crew celebration as the ship passed behind us to the east. Way out in Lake Michigan, with no land visible.